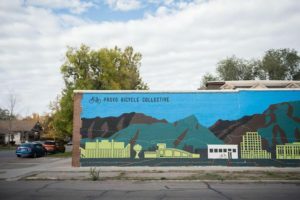 The Provo Bicycle Collective is a non-profit, do-it-yourself shop that sells refurbished bikes at reasonable prices, offers used bike parts for sale, and provides tools and knowledge to help everyone repair their own bikes. During open shop hours, you can drop by and use their tools to repair your bicycle with guidance from PBC staff for a donation of just $10 an hour. Please don’t be shy; just speak up if you’re new to the shop and need help. If you have bikes or bike parts to donate, drop them off during any open hours. Since they are a 501c3 charitable organization, donations are deductible when filing your taxes. Provo Bicycle Collective staff also helps out the community in various ways: hosting volunteer nights at which any interested person can learn bike mechanics and repair bikes for giveaway to disadvantaged populations, putting incarcerated youth through a Jr. Mechanics Certification course at Slate Canyon Youth Detention Center, and giving away hundreds of bikes each year to those who cannot afford to purchase one for themselves. Stop by their Community Bike Shop today and see what they have to offer.